First rule of stake-outs--don’t fall in love. 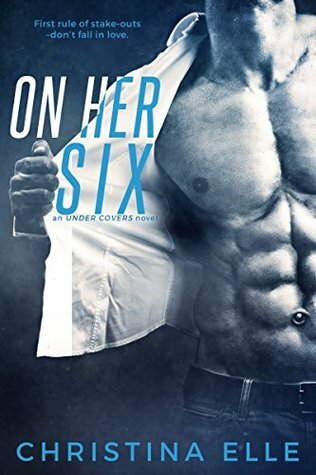 On Her Six is the first book in Christina Elle’s Under Covers Series. The title of the book definitely sums up this story. Ash Cooper is a man on a mission. He’s an undercover DEA agent working in Baltimore, attempting to get a lead on the supplier of a very dangerous and deadly new drug called Vamp. He’s also licking his wounds and biding his time, hoping to get the team lead position back, after he allowed his heart to compromise a mission in Argentina that turned deadly. Samantha Harper is a spitfire. She currently works as an administrative assistant for the Baltimore PD. However, her dream is to follow in the footsteps of her father and grandfather and actually become a police officer. The only problem is that she’s taken the exam six times and has failed each time. Sam lives on a quiet working class street a few doors down from her grandmother and her grandmother’s friends known as the 19th Street Patrol. These women may be in their sixties, but they should definitely not be underestimated. Ash happens to be hiding out on the same street and draws the women’s attention as they’re trying to figure out if he’s a friend or foe. As fate would have it, Sam and Ash are both looking for the same man for different reasons. Sam wants to find Viktor Heinrich in order to find out what happened to her father and if he’s still alive. Ash and his team want to find Viktor in order to stop his drug shipments and find out where the drugs are coming from. Sam is small but tenacious. She’s like a Chihuahua who thinks she’s a Pit Bull. She thinks with her heart instead of her head. She’s not afraid to run into danger, but always sees the error of her ways too late. As Sam and Ash embark on a relationship, Ash once again allows his feelings for a woman to interfere with a mission. The result once again is deadly, but the consequences this time will put Ash’s best friend in the line of fire. On Her Six is a full and complete story. However, due to certain events, a part of the storyline continues to be played out in the second book, In Walks Trouble. I’ve read the books out of order so I knew what was going to happen. For that reason, I kept waiting for things to happen. I truly feel this took away from my enjoyment of the story. One of the reasons I love Christina’s writing is because she writes vivid, detailed scenes that allow you to truly picture the action. That’s definitely in this book. I can’t wait to see what’s in store next for this series.